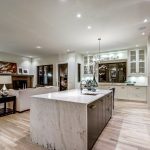 How To Design A Kitchen Island | Bow Valley Kitchens Ltd. There is nothing quite like a kitchen island to add life to your kitchen. Kitchen islands are the absolute highlight of your house or apartment. A kitchen island is much more than just a place to prepare food. It can be a perfect eating space, or it can double up as a place to store stuff. There are many things that go into the design of a kitchen island. First and foremost, you should have a good idea of what its main purpose is going to be. Second, you should study the layout of the kitchen carefully and decide how best to design the kitchen island with functionality in mind. Next, decide on how large you want the kitchen island to be. You don’t want the kitchen island to be so large that it takes up most of the space in the kitchen and cramps up your style. It should be of the right size to allow you to move around the kitchen and use the various appliances comfortably. Also, you don’t want the kitchen island to be too small, as that would look out of place, especially if the kitchen is large and spacious. Shape or design is very important when designing the kitchen. Use “U” shaped or “L” shaped kitchen islands as they give you all the counter shape you need and are ideally suited to large kitchens. The important thing to note here is the accessibility and functionality of the island. Among the popular kitchen island styles are circular islands and rolling islands. The kitchen island does provide excellent storage space. You can get a variety of storage from the island, where you can place a range of appliances such as a wine cooler or dishwasher. You can add cabinet drawers to the island. In fact, you can add any number of cabinets as you like to it – this is a great way to the make your stuff more accessible. Make sure that the plumbing is done to perfection on the island. If you are going to have a sink and faucet on the island, make sure that there are no issues with the plumbing. Arrange for a proper water supply and the drainage system. Remember, functionality is the most important thing when designing a kitchen island. Make it appear professional, fully functional and yet attractive. You cannot expect any mistakes when it comes to the plumbing and most importantly, the electric supply. A kitchen island makes any kitchen look absolutely gorgeous. But it is more than just a stylish addition to the kitchen; it is highly functional and makes it easier for you to use and move around the kitchen. Adding a kitchen island certainly does improve the resale value of your property. 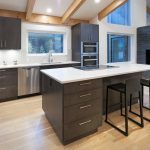 At Bow Valley Kitchens as has been designing and installing custom kitchen cabinets and kitchens in and around Calgary & Canmore for many years now. You are welcome to contact us so that we can install a world-class kitchen island at your home. Our luxurious kitchens provide custom solutions that can be crafted to match a variety of kitchen styles.